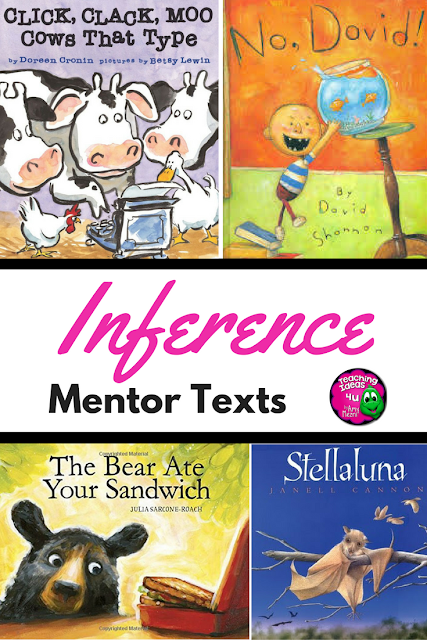 Inference is an important skill for students to learn in order to really dig deep into a text. People use inference every day to make sense of the things people say and do. Students use inference all the time, but they need some guidance in learning how to use the strategy with a text. In order for students to understand what an inference is, they first need to understand what it means to make an observation and a prediction. We observe people, places, and things every day. For example, we notice that flowers are blooming or a dog is barking. An observation is simply noting what you see, hear, or smell. People constantly make observations, both consciously and subconsciously. These observations help people make predictions. For example, if you walk outside and see dark clouds coming, you might predict it will rain later. People use observations to predict possible future outcomes and events. Inferences are things we think are true based on what we already know. If you walk through your front door and small pizza, right away you assume someone is making pizza for dinner! If we see a boy wearing a uniform and carrying a glove, we infer that he plays baseball. When readers make an inference, they don’t always learn if their inferences are correct or not. Prediction and inference are similar, but they have key differences. It is important that students understand how to do both while they read. If students make a prediction while they read, they will usually find out if their prediction was correct by the end of the text. Also, an inference can be about the past, present, or future, but a prediction is usually about the future. 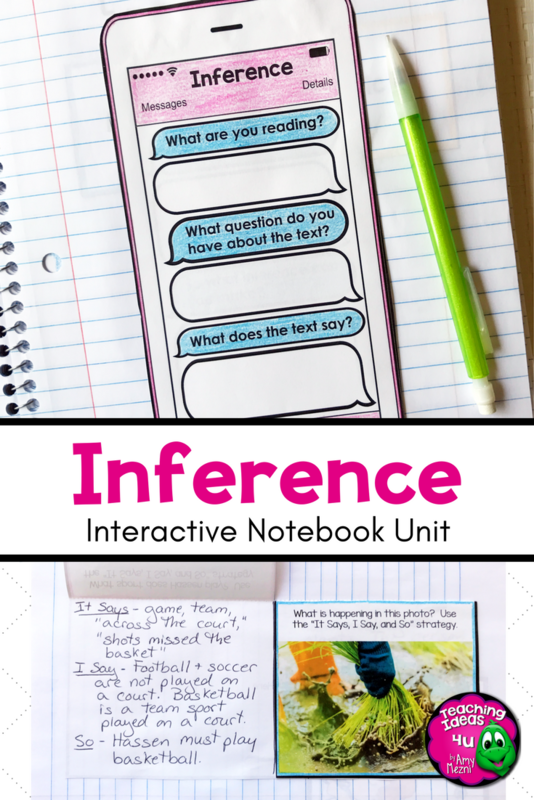 How can we teach students to make inferences about their reading? We also want them to be able to apply this skill to courses that use nonfiction texts, such as science and social studies. Therefore, students need to have an easy way to remember how to make an inference. 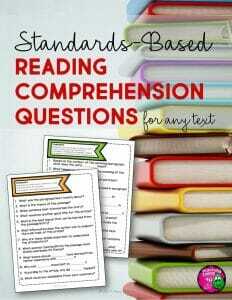 Question – As students read a text, they should form a question about what they are reading. This question can be about character, the setting, the plot, or anything else related to the text. Text Evidence – After formulating their question, students should review the text to find evidence that would help them answer their questions. Prior Knowledge – Students should think about what they already know about the topic that would help them determine the answer to their question. Conclusion – Students should form a conclusion based upon what they learned in steps 1-3. Keep in mind that there is not one correct answer or inference – there can be many! If students are just learning to make inferences, teachers should select subjects that are slightly unfamiliar to students, yet not completely new. Students should have some background knowledge that they can activate to make an appropriate inference. For example, if the class previously studied a science or history topic, the teacher might want to use something related to that for practicing inference. Teachers may want to introduce inferencing with photographs and illustrations. Thinking about a visual and “guessing” is more familiar to students. Every time they watch a video or read a picture book, they see visual images. In a science or social studies class, students could be shown a photograph and asked to make observations about the image. Teachers should keep a list of all of the observations students have. Once students run out of ideas, look at the list and model making an inference from what they already observed. An example of inference in a context situation could be a student selects a book about the American flag. In the book he sees an image of the flag with thirteen stars and decides to find out why. The student reads the text, looking for text evidence that would help him answer the question. He thinks back to a lesson they had about American symbols and remembers what he learned about the flag. Using both the text and his background knowledge, he can infer why the flag had thirteen stars. Again, teachers may want to start teaching inference with photographs or illustrations. However, there are a number or picture books that work well for teaching inference. 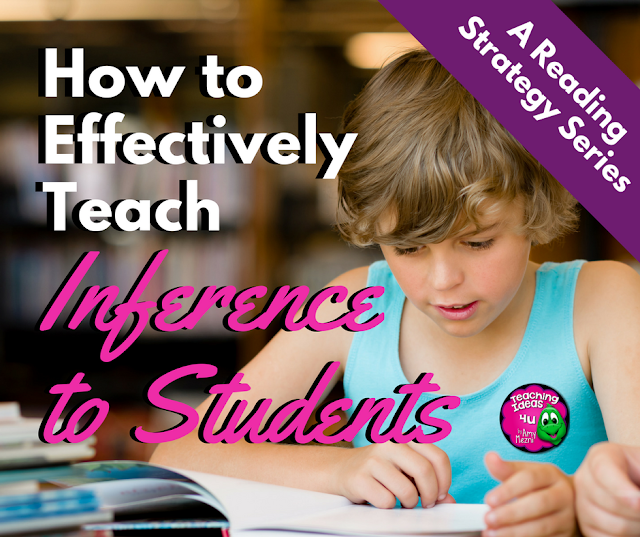 Inference may be hard for some students at first, but with enough practice, they will be able to understand and use this strategy effectively. Are you interested in other reading strategies? Click the links to go to my other blog posts. If you are interested in a resource with activities for teaching and practicing inference, please check out my inference unit in my TPT store.